Mirth Control Comedy return to Inamo in Covent Garden for another evening of cheek aching, side splitting comedy, delicious pan-asian food and wonderful people. Join us on Wednesday 17th April 2019 in the downstairs Onyx Bar at Inamo. Paul Pirie | Steff Todd | Johnny Wardlow | Sonia Aste | Harun Musho'd & Geoff Whiting as your host for the evening! Tickets are just £5 - you will need to order these in advance to gain entry. Please have the confirmation at hand when you arrive - either printed or on your phone. Inamo features 2 Happy Hours between 5pm to 7pm and 10.30pm to 11.30pm what more could you ask for!! *This will be held in the downstairs bar area only and will include 2 for 1 on same selected drinks. 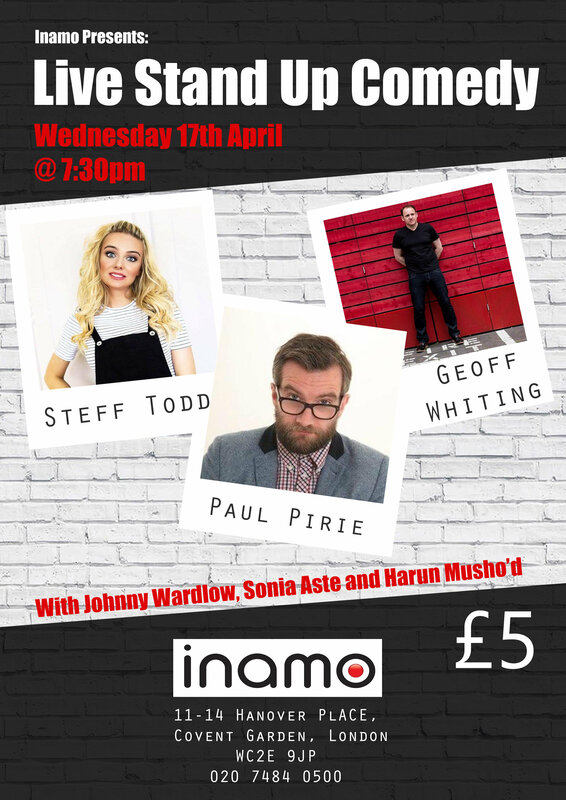 DONT FORGET: Wednesday 17th April 2019 @ 7:30pm! Use this ticket to double up with laughter!